It seems that after every single Premiership game, one of the managers is complaining about a decision that the referee made during the game. Fans are constantly moaning about the poor calls that have gone against their side. Pundits analyse each decision and give their verdicts after viewing it in slow-motion from every conceivable angle. What does this say about the standard of refereeing in the Premiership? Now don’t get me wrong. I do have sympathy with referees. They have an incredibly difficult job that is not made any easier by the players surrounding and yelling at them at virtually every decision. It seems that the FA’s ‘Respect’ campaign still has a long way to go. However, there has got to be a certain amount of reciprocation from referees if players and managers are to respect them more. It often seems as though the referees belong to a secret society that deem speaking to the media and the public as below them. Premier League managers are contractually obliged to give interviews after each match. Why do referees not give interviews to explain their decisions? There is the often quoted cliché that decisions will even themselves out over time. And that may well be true. But the question is, over how much time? As Tony Pulis pointed out, by the time the decisions have all evened each other out, a team may have been relegated. Given the sums of money involved in football, and the Premier League in particular, relegation can be ruinous to a club. Everybody accepts that referees are not perfect. After all, they are only human. However, we expect a certain standard from them. We have supposedly the best league in the world. So, surely it is not too much of a stretch to suggest that we should have some of the best referees, capable of at least getting the big decisions right. Indeed, it was an English referee, Howard Webb, who was awarded the World Cup final – the ultimate prize for a professional referee. So why have there been so many major decisions that have been wrongly called this season? Admittedly, every decision is more closely scrutinised these days, and the pundits are still unable to agree after ten views from ten different angles. However, it is not these decisions that are the disappointing ones. When it comes to refereeing decisions taking centre stage, there is nowhere else to start than Old Trafford. Nani rushed through onto a through ball and went down under the challenge of Younes Kaboul. Whilst lying on the floor, he grabbed the ball with his hands, assuming it was a penalty. Mark Clattenberg gives no penalty, and Gomes puts the ball down, assuming it is a free-kick for the handball. Nani then gets back up and knocks the ball into the empty net. After consulting his assistant, Clattenberg allows the goal. Whilst it is true that at no point did Clattenberg blow his whistle for a free kick, surely common sense must prevail. Nani has clearly handled the ball. Mark Clattenberg should just explain the situation and give Spurs the free-kick. Nobody could realistically have argued with that decision. Instead, he awards the farcical goal. This was another quite bizarre decision by Chris Foy. Tom Huddlestone and Johan Elmander were battling for the ball in the centre of the pitch. Elmander falls to the floor and replays quite clearly show Tom Huddlestone stamp on Elmander’s chest. Chris Foy did not give any decision at the time. Surely this would be the perfect opportunity for the FA to retrospectively punish Huddlestone? Of course not. Chris Foy claimed he had seen the incident at the time and decided that no decision was needed. As a result, the FA cannot take any action retrospectively. Even if the full nature of the incident was not seen at the time. So we have two possible outcomes from this. Either Chris Foy saw Huddlestone stamp on the prone Johan Elmander and decided that was perfectly legitimate behaviour on a football pitch. Or the FA and FIFA rules are so ridiculous that retrospective action cannot be taken. Either way, it is just plain stupid. Stoke have felt that they have had their unfair share of refereeing blunders so far this season, and they probably have a point. However, one of the worst decisions came in their game against Sunderland. Kenwyne Jones rose highest to meet a cross and angle a header toward the top corner. Then comes the controversy. Lee Cattermole fumbles at the ball with his hand, touching it not once, but twice. In addition, the ball may or may not have been over the line. Martin Atkinson gives a corner. Whichever way you look at it, Stoke can feel aggrieved. The replays suggest it is fairly inconclusive as to whether the ball had crossed the line or not. Martin Atkinson cannot really be blamed for that. However, if the ball has not crossed the line, it is a clear penalty and a red card. Cattermole prevented a goal by handling the ball twice. It was not even that subtly done. Stoke felt even more aggrieved when moments later, Kenwyne Jones met another corner and it was Lee Cattermole who cleared the ball off the line. Legally this time, but he should not have still been on the field. Once again, we see Stoke involved. Gary Neville had picked up a yellow card halfway through the first half of the game at the Britannia Stadium. 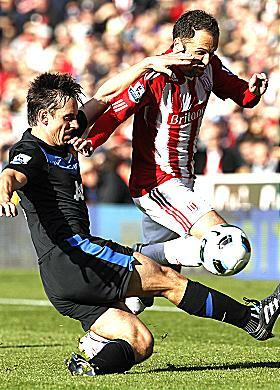 Moments before the half-time whistle, the excellent Matthew Etherington picked up the ball and ran at Gary Neville. He pushed the ball past him and tried to go round the outside of the United defender. Neville slid in nowhere near the ball, taking out Etherington. In almost any other situation, it would have been a clear booking. We see virtually every challenge of a similar nature treated the same way, week in, week out in the Premiership. However, for some bizarre reason, Andre Marriner decided that it wasn’t worth a second yellow card and Gary Neville stayed on the field. Manchester United kept all eleven men and went on to win the game. A game in which the plucky underdogs were taking on the might of the Sheikh-backed Manchester City money machine. That in itself makes it an uphill task for the Tangerines. However, they were also hampered by not one, not two, but three very poor refereeing decisions. Blackpool thought they had taken the lead when Gary Taylor-Fletcher put the ball in the net. However, it was flagged for offside. Unfortunately, the assistant had flagged the wrong player offside. His teammate, Elliot Grandin was indeed offside, but not interfering in play in the slightest, whilst Gary Taylor-Fletcher had been comfortably on-side. Manchester City then took the lead when Carlos Tevez put the ball into the back of the net. Unfortunately, he was clearly offside when he received the ball. Once again, Blackpool could rightly feel hard done by. Then, moments after Blackpool had equalised, David Silva clearly tripped Ian Evatt in the Blackpool half. Nothing was given, Carlos Tevez received the ball and put Manchester City back in front. Now, maybe Blackpool could have lived with just one of those decisions. But three clearly incorrect decisions that directly led to goals being wrongly allowed suggests that something is clearly wrong. Now we move onto the Stuart Attwell compilation. The Stuart Attwell of the ‘ghost goal’ saga. The Stuart Attwell who refused to respect the minute silence for Sir Bobby Robson. The examples of his blunders are not exactly hard to find. When Liverpool played Sunderland earlier this season, there was two highly controversial incidents. The first came after only five minutes. 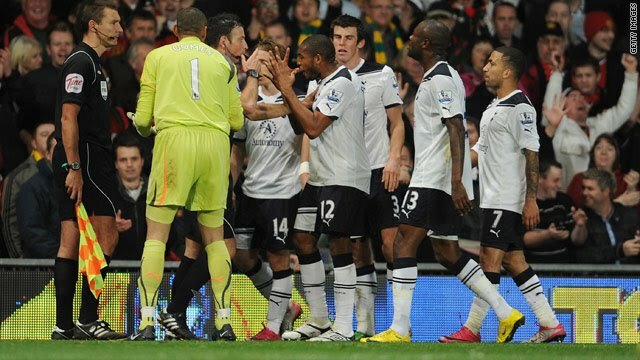 Sunderland were awarded a free-kick and Michael Turner back-heeled the ball back toward keeper Simon Mignolet to take. Fernando Torres collected the ball, passed to Dirk Kuyt, who put it into the open net. The goal was given. Again, it seems like a situation where common sense should surely prevail. Turner was clearly not taking the free-kick. Who would take a free-kick in that manner? However, Stuart Attwell decided otherwise. 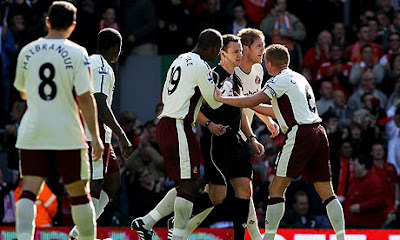 More controversy came later in the game when Steven Gerrard appeared to deliberately elbow Danny Welbeck in the face. Stuart Attwell showed Steven Gerrard a yellow card. If he has awarded a yellow card, he has clearly seen the incident. And if he has seen the incident, he has seen Steven Gerrard elbow Welbeck in the face. And if he has seen Gerrard elbow Welbeck in the face, it is a straight red card. But not in the view of Stuart Attwell. Our favourite referee makes another appearance. This time, Arsenal are playing Bolton. Lee Chung-yong was brought down on the edge of the Arsenal area. A clear free-kick. Not to Mr. Attwell. He wrongly allows play to continue. Mere seconds later, Maroune Chamakh pushes the ball past Gary Cahill on the touchline. Cahill slides in, but catches Chamakh. A bog-standard yellow card. The type seen every week in the Premiership. The type Gary Neville should have received at Stoke. But once again, not to Mr. Attwell. 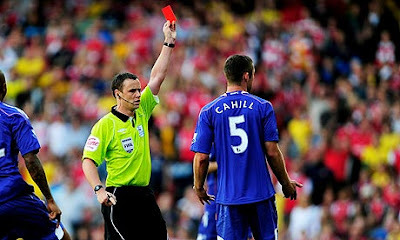 With a flourish, he brandishes the red card at Gary Cahill and Bolton are down to ten men. A youthful Aston Villa side took on the might of Manchester United at Villa Park. 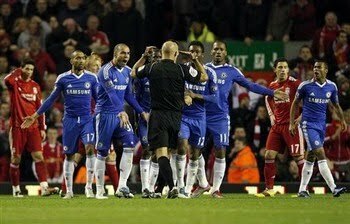 However, a series of decisions from Mike Dean brought back memories of having been wronged in the Carling Cup final last season. Our first incident came when Dimitar Berbatov played a through ball to Javier Hernandez. Hernandez is offside, the referee blows his whistle. Straightforward enough. Hernandez turns round, angry at the referee, turns back and boots the ball away into the stand. A yellow card for dissent as stated in the rules. Not according to Mike Dean. Later in that half, Stephen Warnock and Nani challenge for a ball. Nani accidently kicks a stooping Stephen Warnock in the face with his boot. Nothing at all wrong with the clash. Warnock falls to the ground, clutching his head. Mike Dean should have stopped the play. Head injuries are the one occasion when a game should be stopped for an injury. Head injuries can potentially be very serious. No action from Mr Dean. Into the second half. Edwin Van der Sar hits a long ball forward toward Nani and Stephen Warnock, who have just had an altercation in the United half. Nani takes three looks behind him while the ball is in the air, then jumps back, swinging his arm into the face of Warnock. A deliberate elbow. Mike Dean has seen it, and gives a yellow card. A yellow card for a deliberate elbow? Then Aston Villa break forward. Gabby Agbonlahor slides the ball inside for the on-rushing Ashley Young, who is brought down as he is about to shoot by Wes Brown. Penalty, yes. Red card, no. The rules state that a red card should be shown for denying a goal-scoring opportunity. How much more of a goal-scoring opportunity can you get than about to shoot one-on-one from about twelve yards? Either way, Ashley Young scores the penalty and runs to the crowd to celebrate. Yellow card for the celebration. Ridiculous, but correct according to the rules. Manchester United launch an epic comeback, and it is completed when Nemanja Vidic stoops to head home at the far post. He rushes to the Manchester United fans to celebrate with them, just as Ashley Young had done. Yellow card surely? But he is already on a yellow card. Mike Dean decides not to show him a second yellow for that. Talk about double-standards. A referee’s job is not easy, and we do need them. Indeed, it is ridiculous that technology has not been brought in to try and help them, rather than just used to ridicule them afterwards. However, we do demand certain standards, and even just a level of consistency. Clearly all referees are different, but similar offenses should be punished in a similar fashion. The Gary Neville and Gary Cahill examples above demonstrate this. They were virtually identical challenges, yet one was given a straight red card, whilst the other was not even deemed worthy of a yellow card. And sometimes we need to simply use common sense. The Nani goal and the Michael Turner incident are examples of this. Had the referee simply used common sense, nobody would have even batted an eyelid. Nobody would have talked about it after the game. It would have just been another straightforward decision made by the referee. We constantly have the ‘Respect’ campaign shoved down our throats by referees and by the Premier League. However, when the referees seemingly show no respect for players, managers or the public by refusing to explain their decisions, even refusing to tell us what they have said to each other over their microphones, it is difficult for us to build respect for them. Respect has to be a two-way process. It is simply wrong to be told we must respect referees if they show us no respect.